This species is accepted, and its native range is Temp. Eurasia to Tropical & S. African Mountains. Perennial; caespitose. Rhizomes elongated. Culms erect; 60-200 cm long; 2-3 -noded. Leaf-sheaths without keel; smooth; glabrous on surface. Ligule an eciliate membrane; 3-12 mm long; lacerate; truncate. Leaf-blades flat, or involute; 10-70 cm long; 3-14 mm wide; stiff. Leaf-blade surface ribbed; scaberulous. Leaf-blade margins scaberulous. Leaf-blade apex attenuate; filiform. Inflorescence a panicle. Peduncle antrorsely scabrous above. Panicle contracted; lanceolate to oblong; 15-30 cm long; 3-6 cm wide. Primary panicle branches 5-8 cm long. Panicle branches terete; scabrous. Spikelets solitary. Fertile spikelets pedicelled. Pedicels filiform; terete; 0.3-1 mm long; scabrous. Spikelets comprising 1 fertile florets; without rhachilla extension. Spikelets lanceolate; laterally compressed; 4.5-7 mm long; breaking up at maturity; disarticulating below each fertile floret. Floret callus bearded. Floret callus hairs 1.5-2 length of lemma. Glumes persistent; similar; exceeding apex of florets; firmer than fertile lemma; gaping. Lower glume lanceolate; 1 length of upper glume; membranous; 1-keeled; 1 -veined. Lower glume primary vein scabrous. Lower glume lateral veins absent. Lower glume apex acuminate. Upper glume lanceolate; 2 length of adjacent fertile lemma; membranous; 1-keeled; 1-3 -veined. Upper glume primary vein scabrous. Upper glume apex acuminate. Fertile lemma lanceolate; 3-4 mm long; membranous; without keel; 3 -veined. Lemma apex dentate; 2 -fid; awned; 1 -awned. Principal lemma awn dorsal; arising 0.5 way up back of lemma; straight; 3-4 mm long overall; not or scarcely exserted from spikelet. Palea elliptic; 0.5-0.7 length of lemma; hyaline; 2 -veined. Lodicules 2; lanceolate; membranous. Anthers 3; 2 mm long. Stigmas 2. Caryopsis with adherent pericarp; fusiform; 1 mm long. Embryo 0.25 length of caryopsis. Hilum punctiform. Endosperm farinose. Disseminule comprising a floret. Europe: northern, central, southwestern, southeastern, and eastern. Africa: west-central tropical, northeast tropical, east tropical, and south. Asia-temperate: Siberia, Soviet far east, Soviet Middle Asia, Caucasus, western Asia, China, Mongolia, and eastern Asia. Asia-tropical: India. Australasia: Australia and New Zealand. North America: eastern Canada, north-central USA, and northeast USA. Agrostis umbrosa Pers. ex Trin. Calamagrostis odessana Besser ex Andrz. Paszko, B. & Ma, H. (2011). 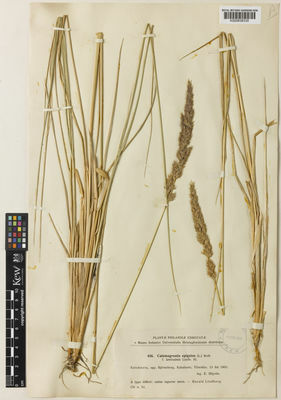 Taxonomic revision of the Calamagrostis epigeios complex with particular reference to China Journal of systematics and evolution 49: 495-504. Roth, Tent. Fl. Germ. 1: 34 (1788).